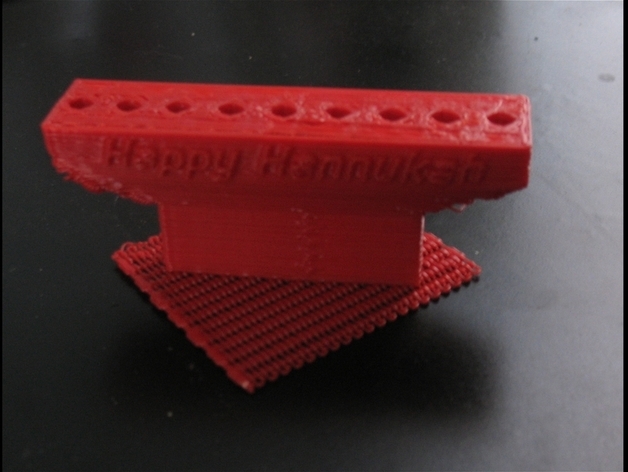 A mini Makerbot-printable Menorah. Little birthday candles fit snugly into the candle holder holes.Created using Rhino3d v 4.0, I'm including the .3dm file in case you want to change the spelling of hannukah (I think there are 5 or 6 alternates in common use. I used a 0.1 infil and left the raft attached for increased stability. (It stands up fine with the raft removed but I figured that having a larger footprint was safer for anything with actual fire). Very straightforward and simple print. I'm not sure why the stl file seems to be imaged backwards here - it prints fine.